A year ago, the VDRC set out to build a new website aiming to maximize accessibility. A year ago, the VDRC set out to build a new website for our organization, with the goal of maximizing accessibility. 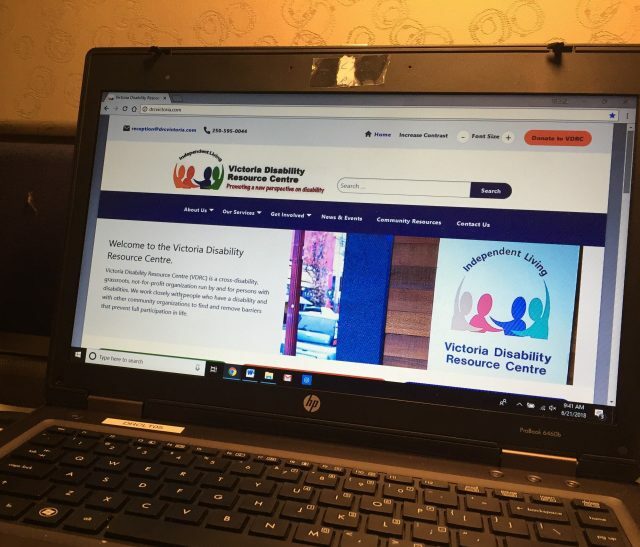 Through switching to a WordPress-hosted website and enlisting the assistance of the website-designers at BONE Creative, we at the VDRC have created an easy-to-update website that continues to strive to meet a high standard of accessibility. The new site follows both the widely recognized Web Content Accessibility Guidelines (WCAG) and the particular needs and wishes of our clientele. The WCAG scores the accessibility of websites on a three-point scale, and we strived to meet the standards at the AA level, which is the standard government websites in the United States and Ontario abide by. In the U.S., basic adherence to these standards is legally required to varying degrees depending on whether it’s a public or private sector website, but no such law exists federally in Canada. To execute this design plan, the VDRC worked with Victoria-based web designer BONE Creative. They were chosen for several reasons, the most important of which being that they were clearly knowledgeable about and committed towards accessibility features. Kelby Mullin, who was then the VDRC’s Learning and Technology Coordinator (in addition to having a background in Human-Computer Interaction from the University of Victoria), coordinated with the designers to ensure that the website was accessible. Kelby combined her knowledge of working at the VDRC and of computer science to translate the needs and wants of the VDRC service users into executable tasks for BONE Creative. The VDRC especially focused on the functionality of screenreaders for the website. While this is not strictly required by the Web Content Accessibility Guidelines, it was judged to be especially important for our service-users. The VDRC website is designed so that individuals employing a screenreader get a smooth and logical flow of spoken information, with appropriate headings and stops. Screenreaders on the website also avoid reading out computer code that is not intended to be heard by the user. These results were ensured through extensive testing by Kelby, BONE Creative, and volunteers from the Pacific Training Centre for the Blind, using a variety of computers and screenreading programs to ensure consistent quality. The software is always changing and evolving, but we aim to continue having a website with a high standard of ease-of-access for those using screenreaders. Additionally, the entire website is navigable in an intuitive way using only the keyboard: custom-code was added for this specific goal. A minimalist layout – featuring large icons and a contrasting colour scheme – were both included as well. Lastly, a bar was added to the top of the website, which allows visitors to change the text-size and increase the contrast of the website. Instructions on how to change these settings for different internet browsers have been included in the accessibility page of the website. We are striving to continue to improve the accessibility of our website. Please let us know if there are any features you would like to have included on the site by contacting us at reception@drcvictoria.com. We hope you enjoy using the new website! Read More about Fidget Spinners: Are They Good or Not?